Signed T M Nicholas lower right. Oil on panel. 8" x 10"
T. M. Nicholas, American, b. 1963. 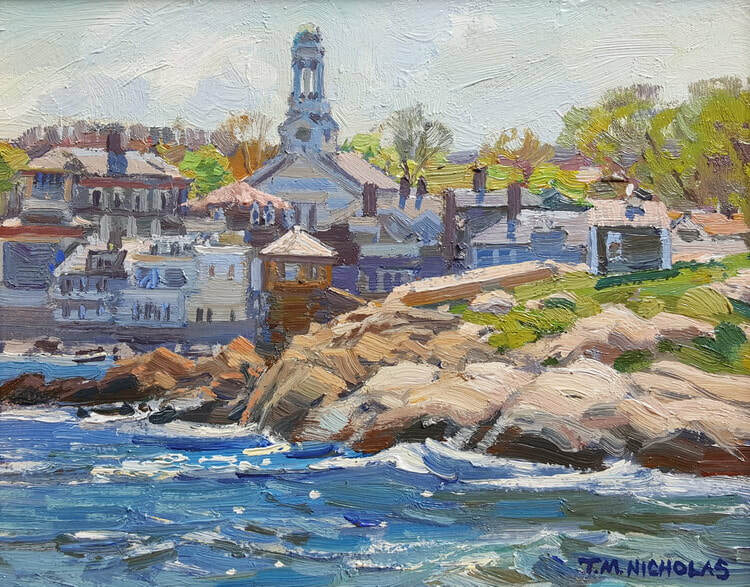 ​​​​​​​​​​Born in Rockport, Massachusetts, T. M. Nicholas grew up admiring the rugged beauty of the northeast coastline of the United States. He quickly grew to appreciate the unique landscapes of coastal New England. His father, esteemed painter, Thomas A. Nicholas offered advice to help T. M. develop his own individualistic style and become the plein-aire painter in oils that he is today. T. M. studied under John Charles Terelak at the Gloucester Academy of Fine Arts. He also studied part-time under Boston area artist George Gabin at Monserrat School of Art, with emphasis on realistic paintings and drawing. T. M. Nicholas is a member of Rockport Art Association, Guild of Boston Artists, Whiskey Painters of America, Hudson Valley Artists, Allied Artists of America, Academic Artists, American Artists Professional League, New England Watercolor Society, and the North Shore Arts Association. His paintings are in many museum and private collections.